Toothpaste Overdose is the accidental swallowing or intentional intake of toothpaste in large quantities. This condition is generally observed in children. What are the Causes of Toothpaste Overdose? What are the Signs and Symptoms of Toothpaste Overdose? How is First Aid administered for Toothpaste Overdose? Who should administer First Aid for Toothpaste Overdose? 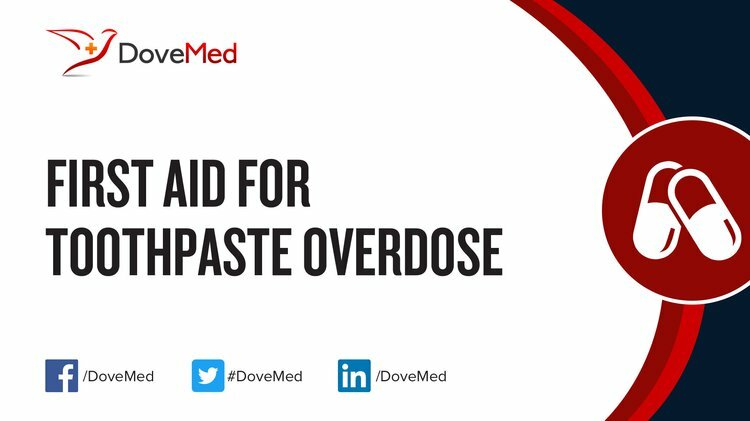 First aid for Toothpaste Overdose is administered by healthcare professionals. What is the Prognosis of Toothpaste Overdose? How can Toothpaste Overdose be Prevented? Treloar, C. (2010). The proof is in the toothpaste: police ordered exclusion as a result of research participation. Australian and New Zealand journal of public health, 34(5), 533-534. Bennadi, D., Kshetrimayum, N., Sibyl, S., & Reddy, C. V. K. (2014). Toothpaste utilization profiles among preschool children. Journal of clinical and diagnostic research: JCDR, 8(3), 212. Sockalingam, S. N. M., Jani, S., & Nor, N. M. (2010). Pattern of Toothpaste Usage in Children Under Six Years Old. Malaysian Dental Journal, 31(1), 14-19. BUSH, C. Toxicology report shows student died of accidental alcohol, cocaine overdose. Basch, C. H., & Kernan, W. D. (2016). Ingredients in Children’s Fluoridated Toothpaste: A Literature Review. Global Journal of Health Science, 9(3), 1. Garg, S., Garg, S., Mehta, M., & Goyal, S. (2013). of Dental Sciences. Indian Journal of Dental Sciences. Wagner, Y., & Heinrich-Weltzien, R. (2014). Pediatricians’ oral health recommendations for 0-to 3-year-old children: results of a survey in Thuringia, Germany. BMC oral health, 14(1), 44. Pancu, G., Andrian, S., Iovan, G., Nica, I., Ghiorghe, A., Sandu, A. V., & Stoleriu, S. (2016). Study Regarding the Influence of Different Fluoride Compounds on Dental Hard Tissues Resistance to Acid Challenge. REVISTA DE CHIMIE, 67(11), 2351-2354.